Posted in Evolution, Mark Pesce, Psychedelics and tagged Evolution, Mark Pesce, Psychedelics. Haven’t posted here before, but I have been keeping up with the podcasts regularly for the past few months. Of course I love hearing Mckenna, but this podcast really blew me away. More than listening to Mckenna, I love being introduced to new writers, thinkers and contributors. I would very much enjoy hearing more talks by Pesce. Thanks a lot Lorenzo, and keep up the good work! I’m now firmly in the habit of listening to these podcasts, which I believe are doing me a world of good. Thanks for getting them out there. I really enjoyed this particular podcast (Mark Pesce). One of his points was that “…at the atomic scale level of the material world is about to become linguistically pliable.” He drew an analogy to magic spells. 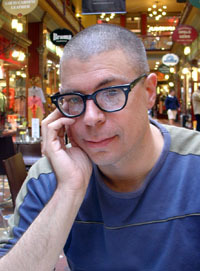 this is mark pesce’s youtube address! I always enjoy Mark’s talks. I can tell he was weaned on Robert Anton Wilson . . . just like me. I’ve always thought most of these talks needed more RAW-like influence. Thanks for the great endorsement you gave http://www.GaianBotanicals.com I really appreciate it!